Two vampires and a Dhampir are front and center, and not a fang in sight! Then again, that's not all that surprising, given the source material, nor is it particularly surprising that the above image - one of three new photos released by The Weinstein Company to promote the feature adaptation of Richelle Mead's Vampire Academy - conjures flashbacks of Mean Girls in its depiction of three very beautiful young women who look like they would capture the attention of any room, vampire-populated or otherwise. And that's just as well, with Mean Girls' Mark Waters at the helm. To be fair, none of these characters are mean girls, though they are stand-outs at the school. Sarah Hyland's Natalie Dashkov is probably the least confident of the trio, and that comes through in the above photo, though her revealing dress does kind of contradict the conservative updo and glasses, and the fidgety posture. Those who have read Mead's book may already know who the characters are in the above photo. To the left is star Zoey Deutch, who plays the story's narrator, Rose Hathaway. Rose is a Dhampir, which is half human, half vampire, and guardian-in-training to the Moroi, a peaceful race of mortal vampires, among which are Lissa, played by Lucy Fry (in the center of the photo) and Hyland's Natalie, who's Lissa's cousin. Rose and Lissa are best friends, and when the story begins, the two are hiding out at some human school, where they're eventually caught and dragged back to St. Vladimir's Academy, where young vampires and Dhampirs are being educated on the ways of their people. For the Moroi vampires, it's practicing magic. And for Dhampir's like Rose, it's training to guard the Moroi against the Strigoi, the dark, immortal vampires that pose a threat to the Moroi. I mentioned the lack of fangs because, while there is some violence, the story isn't drenched in blood and fang-filled mayhem. It's a bit more character driven than that, with more of a focus on the history of the two sets of vampires and where Rose's kind fits into all of that, not to mention a fair amount of high school angst with a supernatural twist. Without getting into specifics and spoilers, I'll just mention that while they're at school, someone is messing with Lissa and leaving some nasty surprises in her room. I'm wondering if the above photo is a shot of Rose in Lissa's bedroom after the mystery person has left a bloody message on the wall. Just a theory. 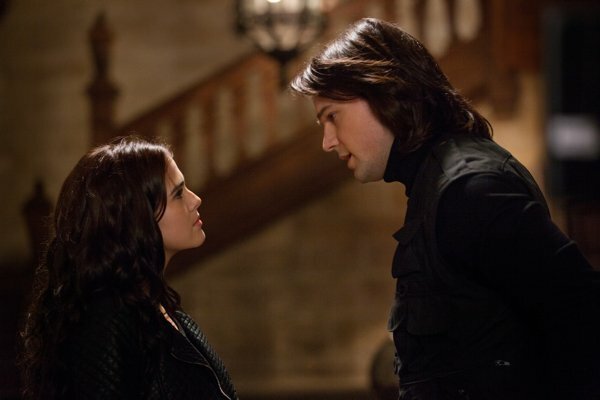 And last but definitely not least is a look at Rose and Dimitri Belikov (Danila Kozlovsky), the Dhampir tasked with training Rose when she returns to St. Vladimirs. As you might imagine, there's some chemistry between these two. The Vampire Academy arrives in theaters February 14. Check out bigger versions of the stills here, and view the bloody motion poster here. Photos credited to Laurie Sparham, Courtesy: The Weinstein Company. All Rights Reserved.